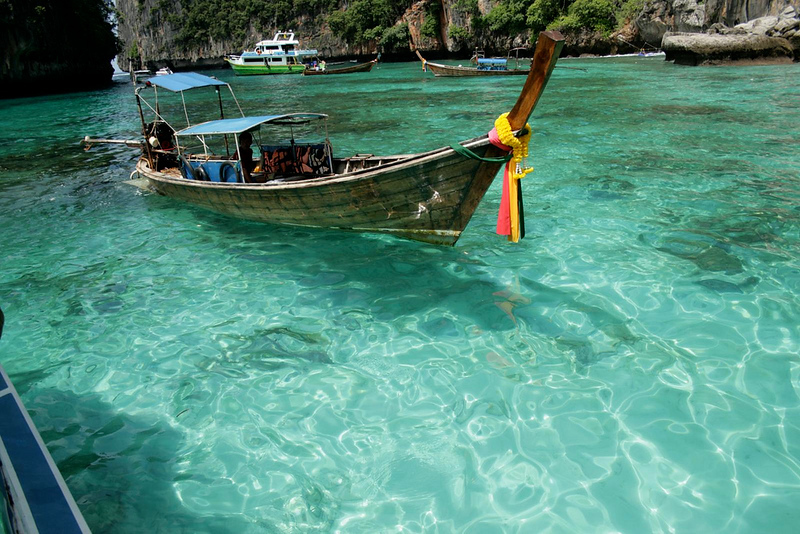 Easily accessible from Phuket and Krabi, Koh Phi Phi is one of Thailand’s most beautiful and exciting islands. Made up of six islands, Koh Phi Phi offers a huge range of experiences, from all-night parties to quiet relaxation on some of Thailand’s most impressive beaches. Choose which beach you decide to stay on wisely! Koh Phi Phi Don is the largest and most developed island, home to all of Koh Phi Phi’s hotels, restaurants and bars. Koh Phi Phi Leh, located to the south, and several other small islands in close range of Koh Phi Phi Don, are popular day trip destinations. Tonsai Village is Koh Phi Phi’s main commercial area. It’s home to a selection of restaurants, bars, souvenir shops and budget accommodation. Perpetually noisy and busy, this is where you’ll arrive after getting the ferry to Koh Phi Phi. You’ll pass through Tonsai Bay on the way to Koh Phi Phi. Although it’s beautiful from above water, Tonsai’s water is a little polluted due to the regular boat traffic. Tonsai can be divided into two beaches: Tonsai East and the quieter Tonsai West. Tonsai East is home to most of Koh Phi Phi’s beach nightlife, with bars pumping music until early in the morning. Tonsai West offers a more relaxing experience, although its location close to Tonsai Village means you’re never far from the action. Beautiful and popular, Loh Dalum Beach is located opposite Tonsai Bay. Although it’s only a short walk from Tonsai Village, Loh Dalum’s much more laid back atmosphere makes it one of Koh Phi Phi’s best beaches for soaking in the sun, provided you don’t mind the crowd. With soft sand and great snorkelling, Long Beach is a quieter beach that’s accessible on foot during the day and by longtail boat after sunset. 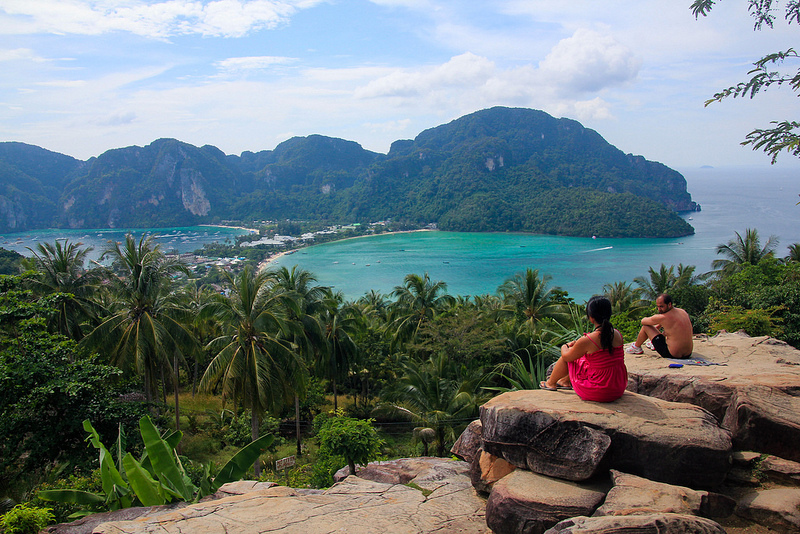 Long Beach faces southwest, giving it great views of Phi Phi Leh’s limestone cliffs. At almost 800 metres long, Loh Bagao Bay is one of Koh Phi Phi’s longest beaches. Located on the island’s east coast, Loh Bagao offers a quieter experience than Tonsai or Loh Dalum, with a smaller selection of hotels and restaurants. Laem Thong is Koh Phi Phi’s quietest and most relaxing beach, located around 45 minutes from Tonsai by longtail boat. With just four upmarket and comfortable resorts, Laem Thong is the best place on Koh Phi Phi to escape the noise and appreciate the island’s beauty. With just one resort, Pak Nam Bay is a great place to escape from the development that’s taken over Tonsai. Home to a small fishing village, Pak Nam is accessible on foot (although it’s a challenging hike) or by longtail boat. Rantee Bay’s shape gives it some of the calmest water of all Koh Phi Phi’s beaches. Quiet and peaceful, you can access Rantee Bay on foot using the path from Phi Phi Viewpoint or via longtail boat. Use the search box below to find out departure times and prices on your selected travel dates to Koh Phi Phi. Surrounded by limestone cliffs, Koh Phi Phi Leh’s Maya Bay is undoubtedly one of Thailand’s most beautiful beaches. Accessible by longtail boat from Koh Phi Phi Don, Maya Bay fills up with visitors in the morning, most of whom head back to Koh Phi Phi Don by the afternoon. Accessible via kayak or longtail boat from Loh Dalum Beach, Monkey Beach is home to a large population of monkeys. Be aware that the monkeys can be aggressive — tourists are occasionally bitten, requiring rabies shots at the local clinic. If you can manage the one hour walk in the hot sun, Koh Phi Phi Don’s viewpoint offers an excellent view of the isthmus that’s home to most of Phi Phi’s development. Bring a camera and capture a photo of the great panoramic view of Koh Phi Phi Don’s two bays. Tonsai Village, Tonsai East and Loh Dalum offer a great selection of bars, most of which remain open until the early morning. Drop by for a beer, cocktail or bucket and an exciting night out. Koh Phi Phi’s beaches are some of the finest in Thailand, and there’s no better way to enjoy the island than by soaking in the sun. Loh Dalum offers the best mix of access and natural beauty, while Long Beach and Laem Thong are better beaches for peaceful relaxation. Koh Phi Phi’s numerous limestone cliffs make it a gun place for cliff jumping. Tour operators will be able to take you to the best cliff jumping sites. Beware that injuries are common on the jagged rocks and make sure you check for underwater hazards before jumping. The crystal clear water and beautiful coral off Koh Phi Phi make it a great place to snorkel and appreciate the local sea life. Long Beach is the best place to snorkel off the beach, while tour companies will take you to some of the best snorkelling locations around the island. There are several dive schools on Koh Phi Phi offering everything from PADI certifications to chartered dive trips. Dive sites range from local reefs to the wreck of the King Cruiser ferry, which sank close to Koh Phi Phi in 1997. Koh Phi Phi’s only five-star hotel, Zeavola Hotel offers a selection of spacious and luxurious suites on the quiet and secluded Laem Thong Beach. Far from the island’s party centres, it’s a great choice for a relaxing getaway or romantic holiday. Phi Phi Island Village Beach Resort is a comfortable 4½ star hotel on Loh Bagao Bay. A large swimming pool and quiet, beautiful beach make this a great place to escape and enjoy a more relaxing experience than what’s on offer in Tonsai or Loh Dalum. Villa 360 Resort and Spa is located on the south side of Loh Bagao Bay, one of Koh Phi Phi’s most relaxing beaches. Great views of the beach, a fantastic spa and free longtail transport to Koh Phi Phi’s other beaches make Villa 360 a great choice for couples seeking tranquillity. Phi Phi The Beach Resort’s location on Long Beach makes it a great place to appreciate the natural beauty of Koh Phi Phi. Rooms offer a great view over Long Beach to Koh Phi Phi Leh, while the resort’s location makes it a quieter option than accommodation closer to Tonsai. Holiday Inn Resort Phi Phi Island offers a selection of rooms ranging from studios to large beachfront bungalows. Located on the quiet and beautiful Laem Thong Beach, this resort is an excellent choice for romantic holidays. Another Laem Thong Beach resort, P.P. Erawan Palms Resort offers comfortable three-star rooms a short walk from the beach. A beachside swimming pool and Thai massage spa make this a great mid-range resort for relaxing holidays. Located at the north end of Loh Dalum Beach, Dee Dee Beach House offers a selection of cosy and inexpensive fan and air conditioned rooms. Far from luxurious but ideal for people that want to be close to the beach yet away from most of the noise. Phi Phi Maiyada Resort is a short walk from Loh Dalum Beach and Tonsai Village, making it a great budget accommodation option for travellers that want to party and enjoy Koh Phi Phi’s famous nightlife. Located right in the middle of Tonsai, Phi Phi Tonsai Place offers a great location for visitors that want to enjoy Koh Phi Phi’s nightlife. Rooms are clean, modern and well furnished, with doubles and twin rooms available. A short walk from Loh Dalum Beach, Sabai Sea View Bungalow offers great views and a selection of simple but comfortable bungalows. Thanks to its location on a hill above the beach, this resort is significantly quieter than other accommodation close to Loh Dalum. Le Grand Bleu serves tasty, homemade French food as well as a great selection of classic Thai dishes. Located a short distance from the pier in Tonsai, Italiano Bar and Restaurant serves Italian and Thai food in a quiet setting. This family owned bar, restaurant and tour operator serves a range of Southern Thai curries alongside strong cocktails. Located on Loh Bagao Beach, Oasis Bar and Restaurant serves a great selection of cocktails, fruit shakes and Thai dishes. As its name suggests, Only Noodles specialises in fried noodles. One of the best restaurants in Koh Phi Phi for Pad Thai. PhiPhi Bakery is a cosy café and bakery that serves a selection of sandwiches and other baked goods. A great place to stop for coffee before exploring Koh Phi Phi. There is no airport on Koh Phi Phi. The nearest airports are located in Phuket and Krabi, both of which are accessible via direct flights from Bangkok, Chiang Mai and other large cities in Thailand. Regular ferry services to Koh Phi Phi operate from Phuket, Krabi Town and Ao Nang. Ferries depart from Krabi to Koh Phi Phi twice daily at 9:00 am and 3:30 pm. 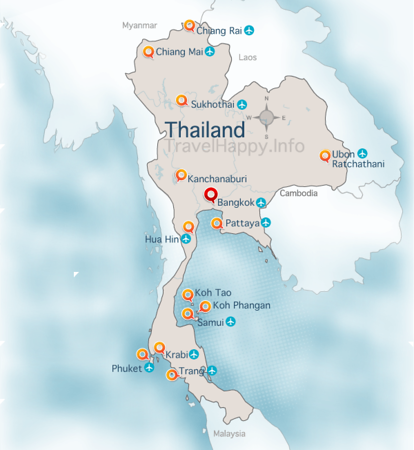 The trip takes approximately 90 minutes from Krabi. Note that the ferry doesn’t depart from Krabi Town — your ticket will include minivan transport to the ferry pier at Klong Jilard. Tickets are 450 baht for adults and 350 baht for children. The Ao Nang Princess Ferry operates on the above schedule from October until May. During the monsoon season from June until September, trips may be cancelled due to rough seas. Ferries depart from Ao Nang at Nopparatthara Port for Koh Phi Phi twice daily at 9:30 am and 3:30 pm. 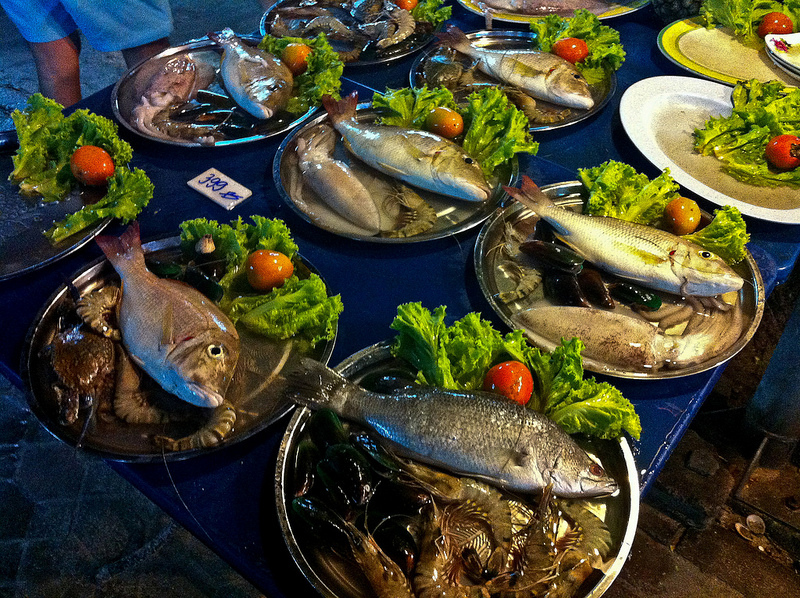 The trip takes approximately 90 minutes from Ao Nang. Ferries depart from Phuket’s Rassada Pier twice daily at 8:00 am and 1:30 pm. The trip takes approximately one hour. Tickets are 800 baht for adults (11+ years old), 560 baht for children aged 2 to 11 years and 500 baht for children under two years of age. You will need to arrive 45 minutes before the ferry’s scheduled departure time to check in (photo ID required). 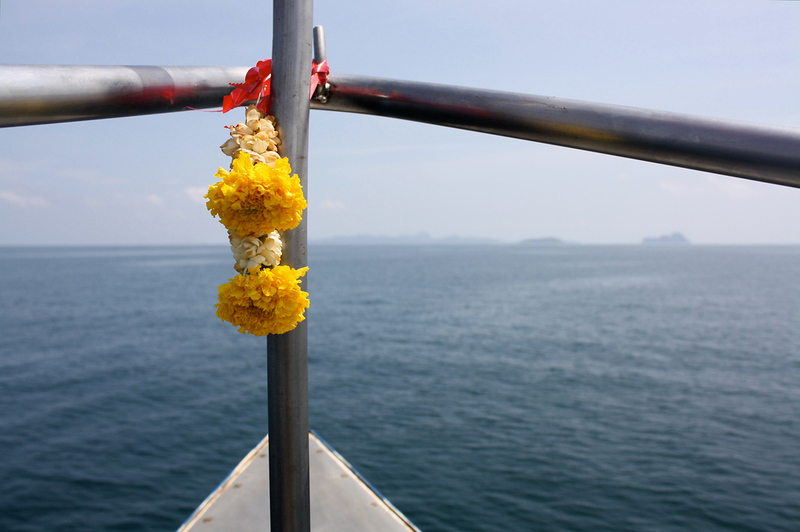 The ferry from Phuket operates until April 12. Ferry services are suspended from May until November each year due to rough seas between Phuket and Koh Phi Phi. The nearest airports to Koh Phi Phi are Krabi an Phuket International Airports. Check Skyscanner to compare airlines for the best prices and flight times to Koh Phi Phi.